Does your family have a special recipe that has been passed down, or a story that goes along with a recipe? Family recipes can make great traditions and also remind us of our loved ones. Here are a few favorites from Christi Center clients and friends – and if you have any to share, please post them in the comments section below! About 40 years ago, when I was meeting my future in-laws, I was to bring a pie to dinner and I thought if Sena’s crust is so flaky, if I add more Crisco and butter—it will still be flakier! I will never forget the distress of having everyone’s piecrust stick to the roof of their mouths! Keep to the recipe!!! Sena is 94 now, and the matriarch of our family, and a legendary cook. Mix wet and dry ingredients well– divide into 4 balls, for pie crusts. Beat eggs slightly. Add Karo, sugar, butter, sugar, salt and vanilla. 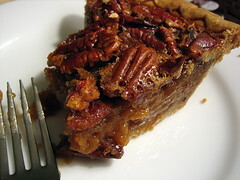 Put 1 cup whole pecans in pie crust and pour on egg mixture. Combine all and make into balls (of about 3T each). Baked on greased baking sheet, for 20 minutes at 350. May freeze before baking, and pull out as needed—defrost first. My grandma used to make them every year and when she got older and they started tasting bad because she mis-measured, we would fight over who had to make the edible batch for the family gathering (they are quite a bit of work to roll out and decorate). 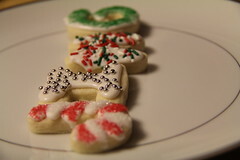 Now that she is gone, we ALL make them every year and we have cookies coming out of our ears! Cream shortening, sugar, eggs, vanilla. Add dry ingredients. Divide into batches and wrap in wax paper and refrigerate for several hours. Roll out, cut out, bake in 400 degree oven for 10 minutes.